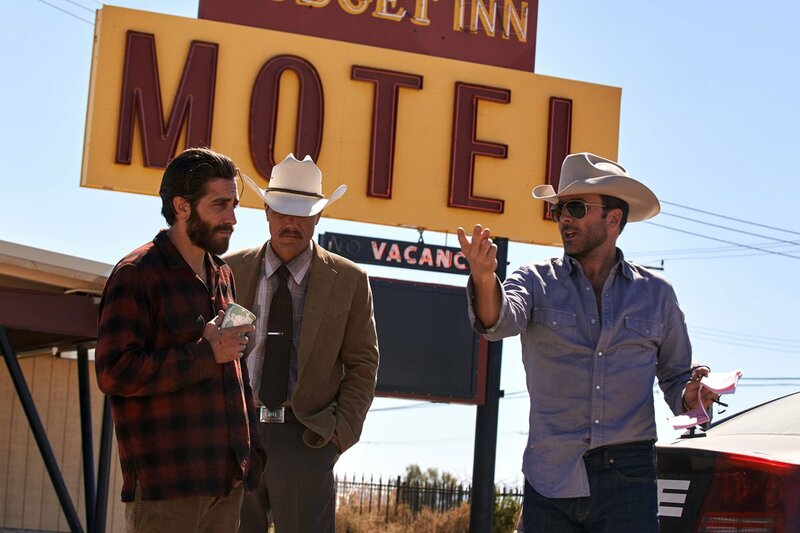 To get into the head of Bobby Andes, the Texas detective who’ll go to any length to ease the pain of a man devastated by a violent crime (played by Jake Gyllenhaal), Shannon tried on everything. “I’ve always been a huge fan of the true-crime fiction—I basically kind of drew on that and mostly used my imagination,” Shannon tells The Wrap. But he found his greatest inspiration by simply putting on Andes' outfit. Costume designer Arianne Phillips explains to Fashionista that she created special Western wear to “reinforce the character's brusque and masculine renegade cowboy persona.” And nothing is more iconic than a Stetson. “The first time I tried on the hat it seemed to unearth...Bobby,” Shannon tells Entertainment Weekly. While Shannon has played nearly every type of person, perhaps his greatest skill is in illuminating the extremes of human behavior. From the psychotic federal agent-turned-bootlegger, Nelson Van Alden, in HBO’s Boardwalk Empire to the maniacal General Zod with his Evil Plan for the Human Race in Man of Steel, Shannon knows how to bring out the worst in us. He is so good at being bad that his filmography charts a full taxonomy of wickedness. At one extreme, he can be pure evil, like when he plays Richard Kuklinski in The Iceman, the contract killer with supposedly 100 murders on his belt. At the other end is the greedy real estate broker, Rick Carver, in 99 Homes, who, as A. O. Scott suggests in The New York Times, “can give predatory capitalism a friendly human face.” “There's a phrase for what I do,” Shannon tells Rolling Stone. “I comfort the afflicted and afflict the comfortable." While Shannon can be very good when he’s bad, he’s also pretty great playing good. He started off as a nice guy. His film debut was a happy-go-lucky newlywed gushing at Bill Murray in the 1993 Groundhog Day. In Liza Johnson’s Focus World drama Return, Shannon shows his tender side trying his best to console Linda Cardellini, a soldier recently returned from combat. For Entertainment Weekly’s Lisa Schwarzbaum, he “meets the challenge of playing a husband who doesn’t understand the wife changing before his eyes.” In other films, like Take Shelter, his crazed demeanor betrays a man who cares too much. “Every character I play, I love," Shannon tells the Los Angeles Times. "I'm playing them because I'm trying to understand them. There's a lot of broken people walking around this world." "Shannon makes me a better writer. He certainly makes me a better director." Curtis Hanson, Michael Bay, Zach Snyder, Liza Johnson, and Franco form a partial list of filmmakers who’ve put him in two of their films. Werner Herzog signed him up three times. And Jeff Nichols has cast Shannon in all five of his feature films, including his most recent, Focus Features' Loving. Theater audiences still can’t take their eyes off of him. “Shannon is a fascinating stage beast, as magnetic as he is onscreen,” exclaims The Hollywood Reporter’s David Rooney about his Tony-nominated performance in the 2016 revival of Long Day’s Journey Into Night. He consistently returns to the stage in both Chicago and New York City, finding applause and acclaim for each production. He has been nominated for different awards for his performances in Tracy Lett’s Bug in 2004, Martin McDonagh’s The Pillowman in 2006, and Craig Wright's Mistakes Were Made in 2010. Tune in to watch the 89th Academy Awards on February 26th, and follow along on Twitter with @FocusFeatures for updates on all our nominees. Nocturnal Animals will be available on DVD, Blu-ray, and VOD on February 21st. Buy it now on Amazon. See Michael Shannon in Loving, now available on DVD, Blu-ray, and VOD. Buy it now on Amazon.